Of all the cruel ironies, I went to bed the night before thinking that this would be my last night of uninterupted sleep for several months. I didn’t get a single second of sleep all night. It was that feeling of nervous excitement that you get before going away on a big holiday. To make matters worse, I was nil by mouth from midnight onwards, with the exception of a sip of water big enough to take my meds. It makes for a long night on the couch when you can’t even have a drink of water. They gave him a chair by my head and he remained there for the entire thing. Just as well really – I had a hard time holding it together for a while so I was grateful for his distraction. The needle in the spine wasn’t as bad as I had expected it to be – the local anaesthetics were worse than the main act. It was when they started rolling my paralised body around that the nausea kicked in. About 10 minutes in, it occurred to me that singing was the only way I was going to get through. Unfortunately, the only song that I could think of was KISS’s “I Was Made For Loving You Baby”. So I sang that on repeat for the entire procedure. I’m not sure it was appreciated by the surgical team after the first rendition. Apparently I stopped long enough to hurl insults (I’m sure I considered them witty reparte) at anyone in view, although I don’t have any recollection of that. Things didn’t go quite to plan. The operation which was supposed to take 30 mins took more like an hour. The babies weren’t easy to deliver and I lost a fair bit of blood. The main thing is that we all came out unscathed, and thanks to the mysteries of the human psyche, I remember very little of it and am in no way traumatised. I’m still bloody glad I’ve had my two children in one shot and don’t have to go there again. So slightly battered and bruised, I sit here today, the proud mother of two of the most perfect babies that I have ever seen. On December 16th at 12:39pm, Israel Hawk Taylor was born, weighing in at 2900 gms (6lb 6oz). He was followed one minute later by his sister Hunter Hawk Taylor, weighing 2940 gms (6lb 7oz). This time tomorrow I’ll be at the hospital, being prepped to meet the two new people that I have made. It’s still pretty surreal, to be honest. People keep telling me to make the most of the peace and quiet, and to get as much rest as I can, but that’s next to impossible when you’re carrying around an extra 20kgs and you just can’t get comfortable! Not to mention the fact that I’m bursting out of my skin with excitement. I know it’s going to be hard work. I know I’m going to be exhausted. I’m sick of hearing those things. All I care about is the fact that tomorrow, I get to meet my children. Today is monumental. It is the last day of my life that I’m not a parent. Tomorrow morning that will change forever. I know that there will be parts that I love and parts that I hate, but at the end of the day I’ll be a mother. And I plan on being the best mother that I possibly can. So babies, I’ll see you tomorrow. Yesterday I was dragged from my couch a couple of times by knocks at the door. Any friends know to just let themselves in at the moment so that I don’t have to get up. The first knock was about 10am. When my frenzied screams of “Come in” elicited no response, I dragged myself down the hallway looking fairly bedraggled and hoping that it wasn’t going to be a live TV crew coming to tell me they were going to Pimp My Ride. Needless to say, it wasn’t. It was a couple of strangers. The man introduced himself and his friend (who was a small nervous looking lady that skulked down at the bottom of the stairs) and then started to pull a book from his bag while saying something about the season of the lord. I somewhat stupidly asked if this was something religious. It was. I told him that I wasn’t interested. He was lovely, told me to have a great day and left. Good on him. No more than 10 minutes later there was another knock at the door. This time I had my mouth stuffed full of food but I answered the door anyway. This time there was a lady there, with an equally sheepish wingman standing at the bottom of the stairs. As she started pulling out her book I asked if it was religious. She said (in a tone that clearly implied that I was an idiot) “Yes, we’re [insert religion that I can’t remember here]”. I said thanks very much but I’m not interested. She asked me what religion I was interesetd in. I told her none. She then asked me what I thought was going to happen to me in the future. By this stage she was starting to piss me off. I told her I wasn’t actually interested in discussing it with her. She exclaimed “but you’re having a baby!”. I shut the door and left her out on the porch. I felt like telling her that if she hurried up she’d catch up with the competition and they could fight it out in the street. I felt a strange mixture of entertained and outraged. It got me thinking about how judged I felt by her – as if I owed it to my babies to be religious. While I appreciate that ‘those’ people feel strongly enough about their individual religions to knock on doors and try to spread the word, I wonder how they would feel if I knocked on their door and tried to preach to them about how wrong religion is and how flawed their beliefs are. If the non-religious were to start knocking on doors an preaching their points of view, all hell would break loose. I’m thinking of getting some brochures of my own put together so that next time they come by I can reciprocate. Last week was an interesting one for me. It culminated in an awful day on Friday – completely of my own doing. On Monday afternoon I saw my specialist and as is mentioned in my previous post, I was given a surgery date of Christmas eve. I wasn’t happy about that at all – no only because I don’t want to be in hospital for Christmas, but mostly because I couldn’t bear the thought of another 3 weeks in my currently painful and crippled state. But rather than dealing with it sensibly, I worked myself up into a state. My doctor told me that he would do something about it, but I was so outraged that I didn’t take that on board. I spent the week sitting at home by myself doing WAY too much thinking. By Friday I was a neurotic mess. That has never happened to me before. I am usually really philosophical about that sort of thing. I don’t allow myself to get emotionally out of control. It serves no purpose. It certainly wasn’t punishing anyone but myself. I got so worked up and angry that I couldn’t sleep. I spent the night on the couch watching TV and was completely washed out. On Saturday I decided that something had to change. I realised that at the end of the day, the only thing that matters is that these babies are born healthy, and if that means waiting until Christmas day, then que cera. I was still pissed, but I could live with it. Then yesterday I exercised a cunning plan. I spent the morning doing the vacuuming and grocery shopping, meaning that by the time I went to the specialist at midday, my legs were so swollen that I couldn’t walk. I figured that he’d take pity on me (or worry that I was about to die of deep vein thrombosis) and sort something out. The first thing he asked me when I walked into his office was whether I’d heard the good news. I hadn’t. His nurse was supposed to have contacted me earlier to let me know that the date had been brought forward. Oh. I spent the rest of the day in excrutiating pain, laughing at the irony. So all is well. This time in exactly one week I’ll be throwing my bags in the car and preparing to head in for surgery. Even though I’d prefer it to be slightly sooner, a week is manageable. Now that I have a realistic date to work towards, all is right in my world again. 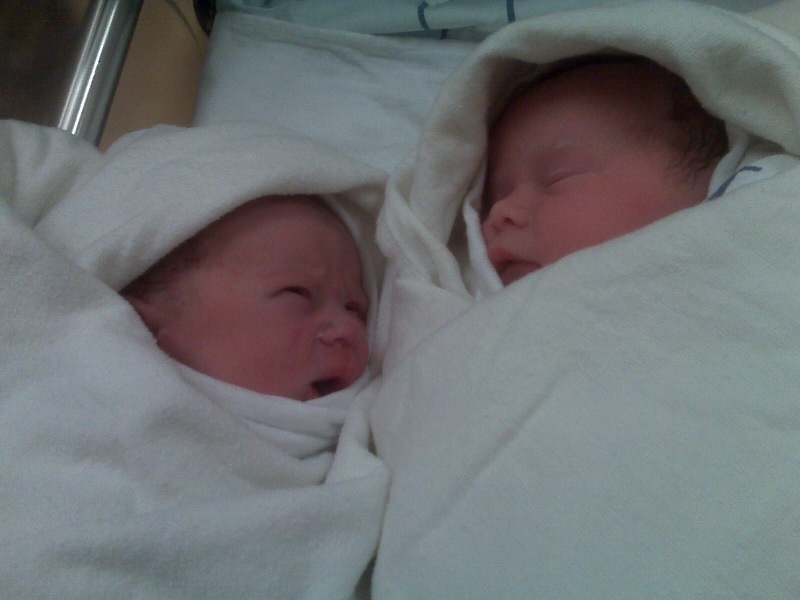 So babies, I’ll be seeing you in a week. Well, I have reached that stage that every mother talks about. I’m sick of being pregnant and I just want to meet my babies. I have gone from thinking of them as ‘things’ to actual babies. People, I guess. I’ve done all the reading of parenting books that I guess all new parents-to-be do, and I’ve started imagining my son and daughter in the future. The life that we will have together. And I just want them here. I got my surgery booking date from the hospital. Christmas eve. Like hell! I’ll be 39 weeks by then! That is just a joke. 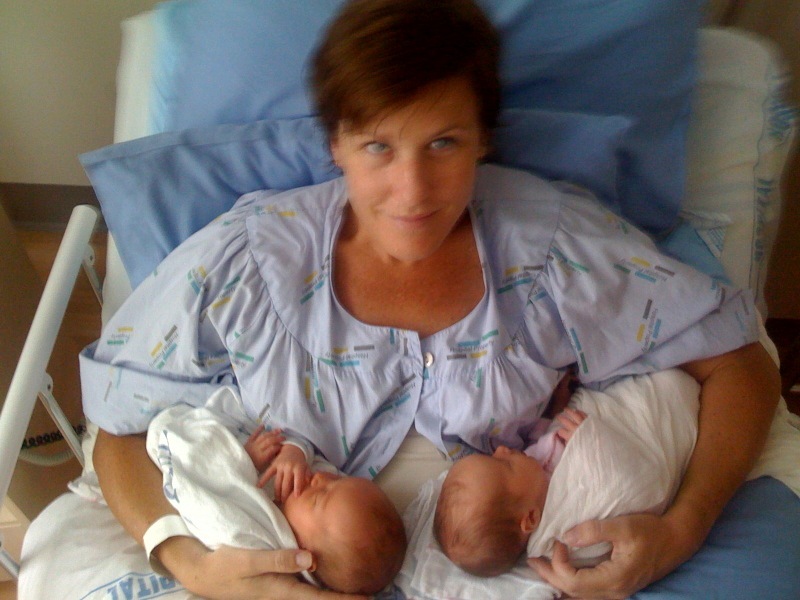 Twins are generally delivered at 37 (sometimes 38) weeks. Aside from the fact that being in hospital over Christmas isn’t ideal, I really just can’t carry these babies for another 3 weeks. I’m already carrying almost 11lbs of baby, not to mention all the fluid etc. I’m crossing my fingers and hoping to go into labour any day. It’s highly likely. I’ve been thinking about the kind of people I want my children to grow up to be. For most of my pregnancy I’ve been envisaging them as babies, but haven’t really thought of them as people. It’ll be fun to have babies. I’m not so big on toddlers and small children, but I can’t wait to meet the people that they will become – with our help. Shaun will be an amazing father. He is so placid and thoughtful. He has so much love to give. He came home with a couple of books called ‘Growing Great Girls’ and ‘Growing Great Boys’ and he’s been reading like a demon. A girl can’t ask for much more than that in a husband and father-to-be. All the books talk about having a ‘vision’ for your children. They talk about creating secure childhoods and happy memories. I’m looking forward to taking my kids to the park. I’m looking forward to teaching them to climb trees and do flips on the trampoline. I’m looking forward to letting them be kids. There won’t be any ‘you can’t do that because it’s dangerous’ stuff. I think we’ve gotten so PC about protecting our kids that we are protecting them from life. They no longer learn to make decisions about risk taking. They think that if they’re allowed to do it, it must be safe. That’s crazy, not to mention irresponsible parenting. But again, I’m getting ahead of myself. Right now it’s a case of pulling on my compression tights, putting my feet up on the couch and just waiting. I’m almost beside myself with excitement. Babies, I can’t wait to meet you.